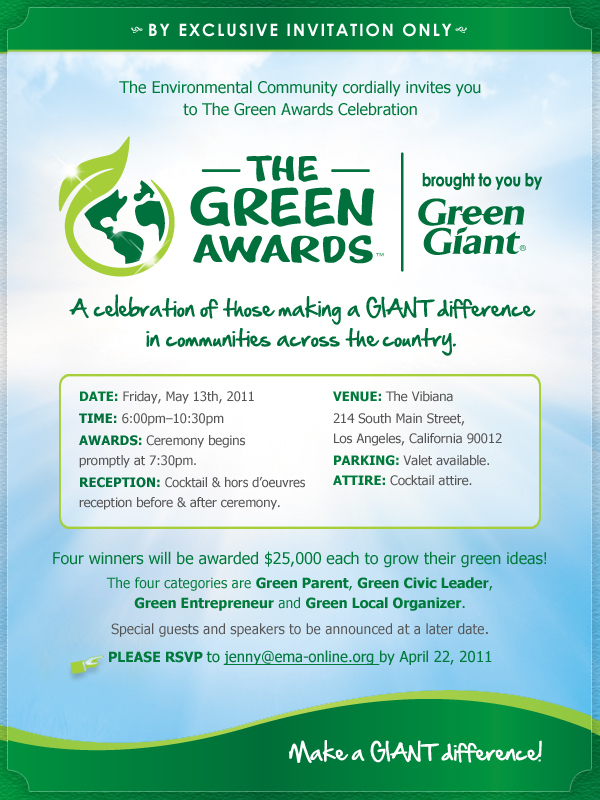 This past May, Mix Creative was honored to be able to work with the innovative local marketing firm Effect Partners™ to design signage and marketing collateral for the first annual The Green Awards™ brought to you by Green Giant®, held in Los Angeles, California. 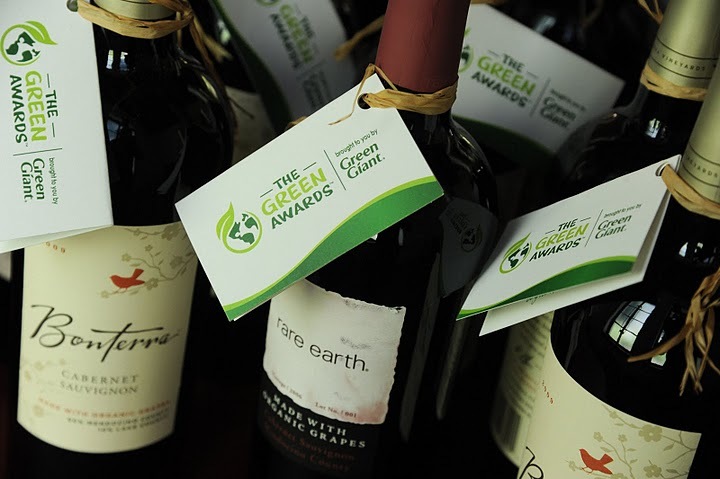 Not only was this a fun project visually, but we loved being able to be a part of this worthwhile cause that celebrates and awards individuals working to make a difference with their environmental initiatives. 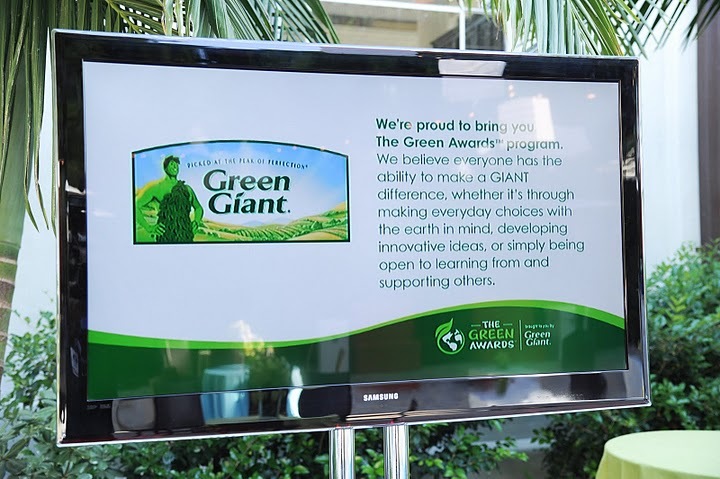 From a design perspective, it was critical that we follow the brand standards as established with Effect Partners and Green Giant by international branding firm, CBX. This included appropriate usage of brand assets, colors, and fonts as outlined in a Visual Asset Guide. Much of the work included presenting the information in a clear, concise manner with careful consideration of the visual hierarchy, editing and writing text as needed. 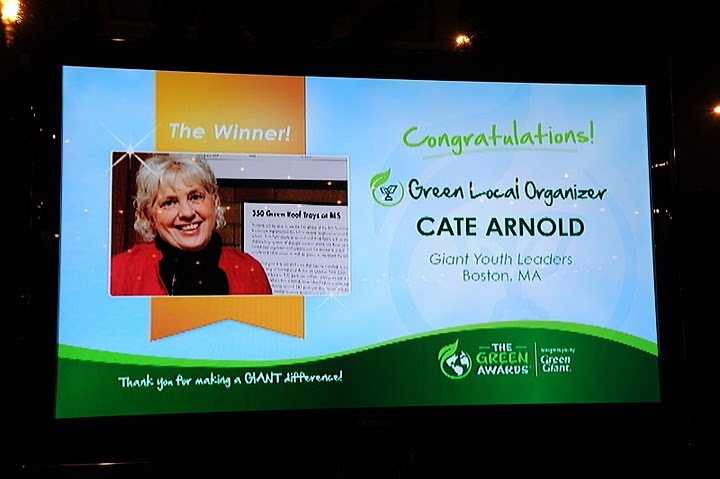 Work ranged from an environmentally-friendly email invitation and online RSVP, to promotional signage accompanying a publicity event at Lake Calhoun, to digital signs at the Awards ceremony. 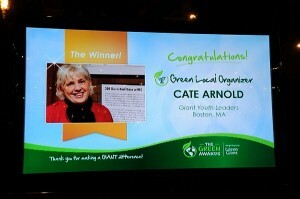 Perhaps most exciting was designing the actual awards envelope, used by the announcers to reveal the award winners. 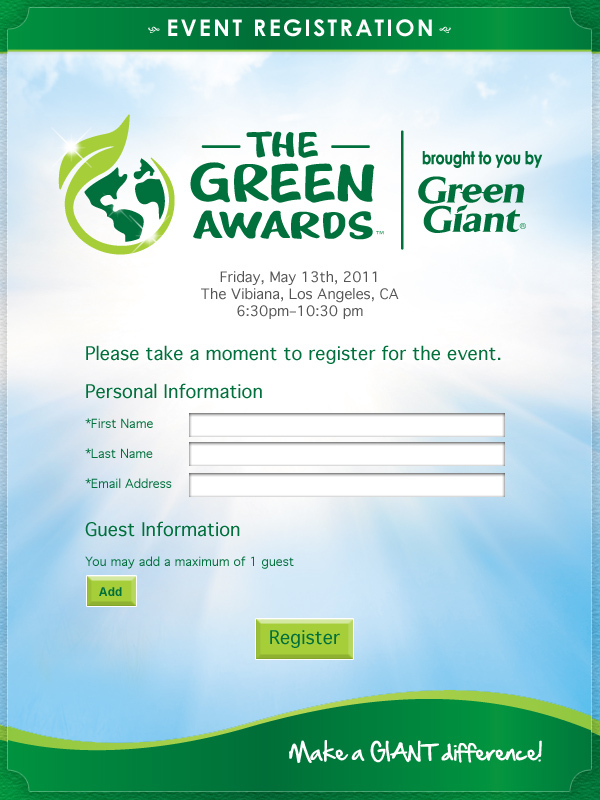 This The Green Awards email invitation included hard-coded text that would appear in browsers, even if the user selected not to load images. 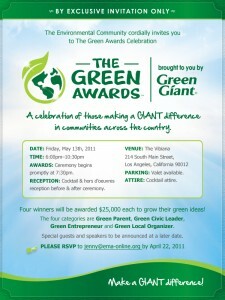 The invitation was viewable in an email browser or online. 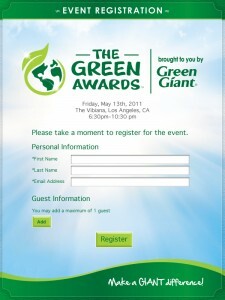 This online RSVP form for The Green Awards allowed guests to quickly register for the event—sans paper or postage!. These The Green Awards-branded folded cards are blank inside to allow a personal message inside. 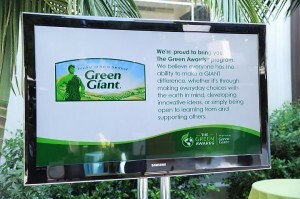 To reduce waste, signs were created digitally and displayed on rented flat screen monitors. The format allowed signs to change from "Nominees" to "Winners" following the awards ceremony. Before the awards ceremony, digital displays introduced the candidates for Green Entrepreneur. 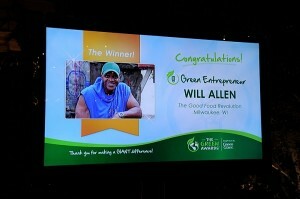 Another flatscreen digital display graphic announcing the winner of the Green Entrepreneur award. 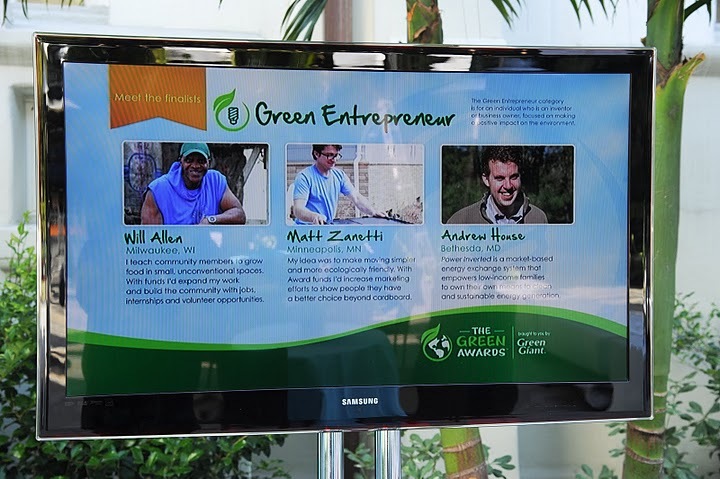 This flatscreen display featured rotating images of Awards Board members, including their logos and a description of their organization. Thank you to the wonderful people at Effect Partners, especially Genna Carlson and Katie Parker, who wowed me with their innovation, communication and organizational skills. Thank you also to David Wild of Wild New Media for converting our digital signs into DVDs to run on the display screens. Finally, thank you to Mix Creative web developer Steve Ray, for programming our email invitation and RSVP form, and pushing Constant Contact to its limits. This entry was posted on Monday, July 18th, 2011 at 6:52 am and is filed under Uncategorized. You can follow any responses to this entry through the RSS 2.0 feed. You can leave a response, or trackback from your own site.